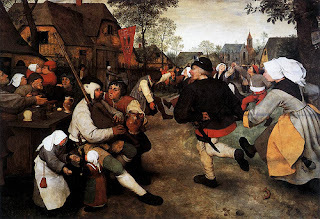 The Peasant Dance by Pieter Bruegel the Elder is a depiction of the peasant life in the late 1500’s. He was particularly interested in how they lived, dated, married, ate, dressed and relaxed. It was a life that fascinated him but also was part of his very core existence. To Bruegel it was a simple life that focused on the day’s happenings and seemed a natural existence connected to nature. The scene is lively and the painter is well known for his humanist pictures. The people within the painting are larger than life which appears to embolden their lives. Bruegel seems to be trying to make distance from himself and his peasant background by painting the figures oafish by nature. He moved his way up the social ladder and continued to be fascinated by the way the peasants lived due to his deep connection with them. The painting shows a Madonna on the tree that appears to be ignored as the peasants engage in their fun. The life of the present, now, and materialism has made their way into his work in an apparent rejection of the spiritual realm. Some have argued that the deadly sins (i.e. hitting each other on the table) are all depicted within the painting somewhere with greed gluttony and lust being most prominent. Pieter Bruegel is a Flemish Renaissance painter born in Netherlands from 1525-1569. He was born at a time when Europe was in dramatic change. It was when Italy was at its highest artistic development and great masters like Leonard di Vinci and Michelangelo were cranking out their works. Humanism was part of human development in which people thought that humans were generally good and able to socially solve problems. All things were rooted in human nature and its capacities.